Damn, I hate it when I spoil the punch line of an article before it’s already begun. As you’ve probably already guessed, according to my blood test results I’m even healthier than last year. For reference, you can check out my blood test results from 2017 here. Before we get started, mega thanks to Wonderful Husband for letting me talk about his blood test results. After *cough* a lot of *cough* persuasion, Wonderful Husband agreed to have a blood test this year (he’s never had a blood test before). The reason for my constant nagging was because I was becoming concerned that he eats a mostly-vegan diet at home but he refuses to take B12 vitamins. Wonderful Husband doesn’t like the idea of taking supplements. – Factory farmed animals eat an unnatural grain diet. – Therefore they no longer consume cobalt from the soil. – Therefore they are unable to make B12 in their intestines. – Therefore farmers now supplement the animal’s feed with cobalt. So guess what, whether you’re vegan or non-vegan you’re probably getting your B12 (or maybe not in Wonderful Husband’s case) in some sort of pill form. But I digress, let’s focus on the blood test results. 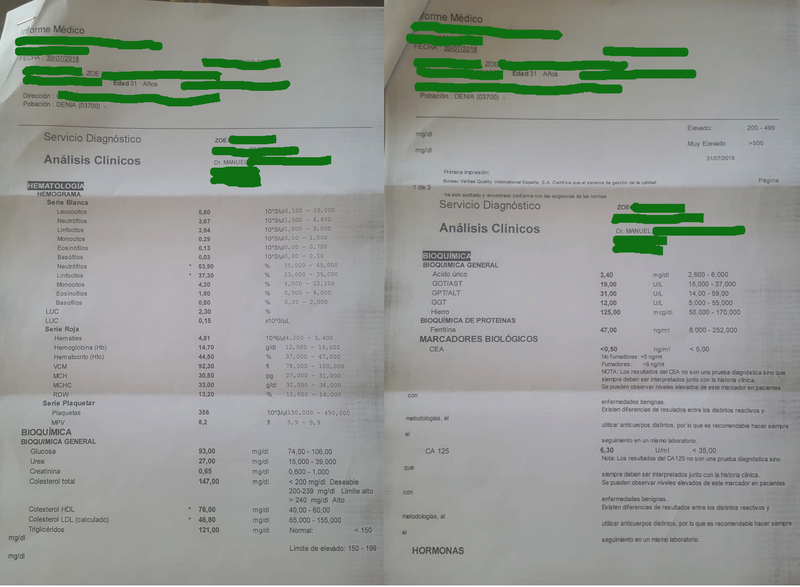 Last year, my blood test showed that I was wayyyy over the required amount of B12 and I was, understandably, a little bit smug, however this year, can you believe that the clinic didn’t include our B12 (and alkaline phosphate) results!? My glory has been tarnished and I no longer know whether I am the B12 queen (yes, I gave myself that name). I honestly don’t know why B12 wasn’t included (probably due to my bad Spanish) and the receptionist at my doctor’s surgery is a little intimidating so I’m a bit scared to ask. The only noticeable differences found between mine and Wonderful Husband’s blood test results were in the red blood cell count and the MCH (Mean Corpuscular Haemoglobin). Having a low red blood cell count and a high MCH can both be a sign of a B12 deficiency. Considering that my results were fine and that the only real difference in our diets is that I take a B12 (and multivitamin) tablet could mean that Wonderful Husband is deficient and this could easily be fixed with a simple supplement. Did you read that Wonderful Husband? The B12 vitamins. You know, the ones that are in the bathroom cupboard, below the sink, marked in a box which says ‘B12 vitamin’. I live in hope. Similar to my blood test last year, I have a slightly low proportion of neutrophils and slightly high proportion of lymphocytes. In extreme cases this could be an indicator of several horrible diseases (according to a Google search) however as it is roughly the same as last year I’m not going to worry but I will address this with the doctor when I have my blood test next year. Last year my ferritin levels (the ability to store iron in the blood) were lower than the advised range. My doctor told me to take an iron supplement for one month out of every three and tadaaaaaa: I am now in the desired range for both iron and ferritin. As I mentioned above, for an unknown reason my alkaline phosphate result was not included but it was for Wonderful Husband. The reason I mention this result (or the lack of it) is because it is a good indicator of vitamin D and calcium levels (so I would have really liked to see it!). I don’t think I have any reason to worry, however I will be making sure that the alkaline phosphate result is included in next year’s blood test results. So until then, I will be consuming fortified foods (including my normal oat milk fortified with both calcium and Vitamin D) as well as taking my daily multivitamin (suitable for vegans) and enjoying the wonderful vitamin D that comes in the form of the Spanish sun. The absolute star of the show were my cholesterol results! At first glance, when I saw the numbers were outside of the advised range I thought ‘oh crap, I’m being punished for my love of Violife cheese’, however I was very happy with my results after a bit more research. HDL cholesterol is known as your good cholesterol and I have even more than the advised range. Having even more cholesterol than the desired amount sounds awful but it turns out that the higher your HDL rate – the less chance you have of developing heart disease. Winning! LDL cholesterol is known as your bad cholesterol, and I have a level that is even lower than the desired range. A very low level of LDL cholesterol can be connected with some inherited issues (which I am not aware that I have) but otherwise it is generally associated with living a healthy lifestyle and, again, less chance of developing heart disease. Double winning! So those were the main points of my blood test that I wanted to share with you. For more details you can find my full blood test results here. ← Would You Swap Places? I have to take a test eventually as well… although I’ve had too many needles in my body this year and I don’t know if my body will hate me if I voluntarily ask for another one. I am too “against” (more like reticent) taking supplements, I’d rather have it included in my diet somehow. The milk alternative I take (Oat “milk” from Lidl) has a B12 supplement, the vegan cheese I take (Violife) has a B12 supplement, and Redbulls (which I take more than Alba’d like) also have loads of B12. I hope that when I take my test, eventually, the results come out ok! Thanks for such a great and detailed post! Good to know you’re checking out your health regularly. I know many people around me, including some in my family, think a vegan diet lacks nutrients. However, as you (and I know), a vegan diet is very healthy..and I so wish I could at least try to be vegan. I haven’t taken a blood test in awhile. Maybe I should! I definitely need to go get my blood checked soon! I haven’t been tested since I have become mostly vegan. I’m quite concerned about the B12 levels too. This post was super informative – thanks! Definitely reminds me to get my own blood work done! OK I’m in the club with your hubby. I really need to take B12. A friend told me it could help with some pain I’ve been having in my foot. Getting supplements today!